If you are looking for a long-term solution to your problem of cold feet or if you simply enjoy wearing really cozy slippers at home, these very special down slippers are for you! These fabulous slippers, filled with the very highest quality “Premium Class-1” down, are the best possible present for your feet – and for you! Comfortable, light, fluffy and deliciously warm, these slippers also have a hidden secret: A special thermo-regulating fabric which guarantees added warmth for your feet which will keep them magically warm all the time. Utter bliss! Warm, comfy feet all through the winter months! For your safety, the sole of each pair of slippers is made of a very resistant anti-slip leather material, and when they need washing you can simply put them into the washing machine with other dirty clothes at any temperature up to 60 degrees Centigrade. After a long day’s work you deserve a well-earned rest, and what could be a better present than these truly comfortable slippers? As you move around the house doing household jobs, or whilst you lie on the sofa in the living room, you couldn´t bear the feeling of the warmth on your feet of these marvelous Temprakon-Advance slippers? The perfect gift for you, your family and your friends! We all know that sometimes it’s difficult to think of something useful and suitable to buy for a birthday present or for Christmas, and here you have the perfect solution for absolutely everyone! Give love, warmth and comfort to family and friends who you want to please. You will be very popular! An ‘intelligent’ cloud of the softest down under your feet! Temprakon-Advance down slippers are filled with the best possible down filling on the market. The “Premium Class-1” down filling cannot be rivaled; it is the veritable king of all downs! It doesn’t lose its smooth feel and doesn’t get lumpy as time passes, remaining as soft, fluffy and comfy as the first day you tried them on! Once you have them on, you will never want to take them off! The filling used for the slippers is made up of 90% down and 10% small feather with a 220gr/square meter weighting. The slippers can be machine-washed at up to 60 degrees Centigrade. Apart from the high quality down filling, the slippers have been made using a resilient, 100%- natural Super-Cambric cotton fabric which is soft to the touch and hypo-allergenic. The filling is well balanced throughout each slipper so avoiding any displacement of the down taking place even after continuous wear. You may well ask what ‘intelligent’ means when referring to a fabric! Inside each pair of slippers and making sure your feet are kept warm and cozy at all times, the manufacturers have used this special ‘intelligent’ thermo-regulating fabric, aptly called intelligent because it really is able to regulate the temperature of your feet. The material is able to accumulate heat and then retain it until your feet require it! In this way you will find your feet, which used to cold in colder weather, are always kept at an optimum temperature, are always comfortable and your troubles are over! Find out more about the thermorregulating system Temprakon-Advance. 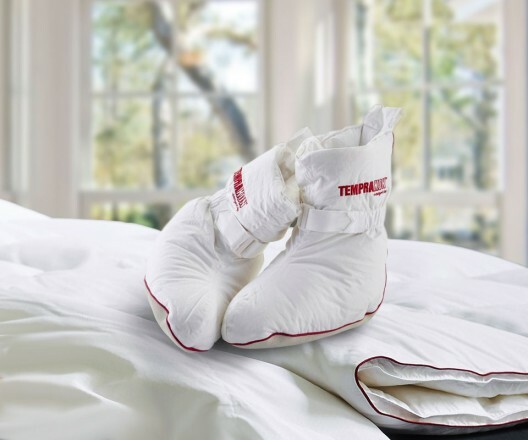 Duvet Slippers TEMPRAKON-Advance offer quality, luxury and comfort at an attractive price! Our suppliers and manufacturers have done their very best to produce for you these amazing slippers. They have been made using top quality materials specially chosen to keep your feet warm. We also all know warm, feet make our whole bodies feel warmer and as soon as we feel warmer we are also much happier! And to give you added confidence when you make your purchase the materials used have been certified by: Oeko-Tex, Astma & Allergi Danmark certified, Nomite, DOWNAFRESH / DAUNASAN, European Down & Feather Association y Certified Space Technology. Having employed such high standards of quality control the result for our clients is soft down slippers which are mite-free, hypo-allergenic and highly recommendable for sensitive feet. 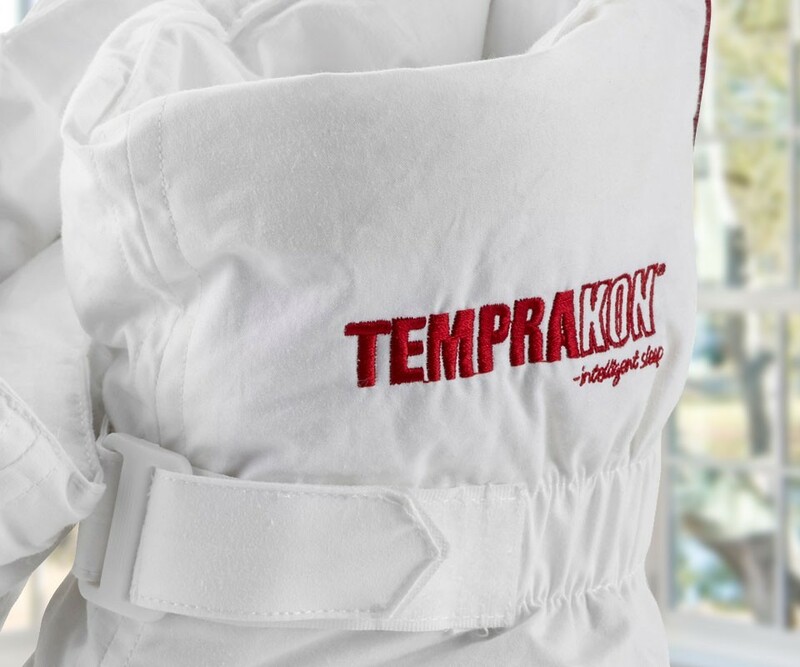 Thanks too to our policy of ensuring total satisfaction we are able to guarantee you without any hesitation a trouble free purchase along with many hours of untold pleasure whilst wearing your new TEMPRAKON-Advance down slippers. In order to keep your slippers in tip-top condition machine-wash them at up to 60 degrees Centigrade and don’t forget to dry them thoroughly afterwards. Drying your slippers in the clothes dryer together with two tennis balls will ensure your slippers stay soft and fluffy. For washing we recommend the use of detergents for delicate clothes and without enzymes. Perfect for me. I suffer from really cold feet in the winter. The same present for a married couple. Easy Christmas shopping! You don’t have to think what to buy. These are the tops! I saw them on Internet, got them and gave them to my Mum for her birthday. She loves them. A great present. I have given them to a lot of family and friends. Fantastic present! A very welcome gift. Good price too. Thank you. My wife doesn’t take them off! Let’s hope she buys me some soon too! I love these for my feet which are always cold. A good present for Christmas or a birthday. They must be good! My feet are warm now! Very good. A super present. Our friends have seen them and want them too. Warm, cozy feet while you’re on the sofa watching TV. Got these socks just a week ago – and my boyfriend and I are over the moon. We don’t bother to use slippers at home now. They are very comfortable and our feet don’t sweat. Much better! Good for yourself and for family and friends. Different from ordinary slippers. So warm! Simply marvelous. Thanks for your help and advice.